Manufacturer Wild View Web Products Inc.
Buy a WVW Gift Certificate for your favorite outdoor enthusiast by simply clicking (Add To Shopping Cart) below. Print a copy of your receipt and give as a gift. Have the lucky recipient contact sales@wildviewweb.com to redeem their discount towards a purchase of any product in our store. 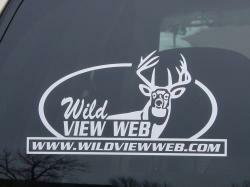 6" x 10" x 0"
Window decal for your truck, hunting shack or camper!!! !